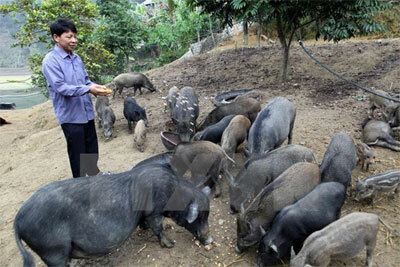 The People’s Committee of the central province of Binh Dinh has approved a master plan for developing the animal breeding sector by 2020 worth 1.73 trillion VND (77.9 million USD) from different sources. Under the plan, specific areas in the province will be zoned off for raising different kinds of animals in a bid to ensure supply of high quality food for domestic demand and for export. The sector’s production value is expected to increase six percent year-on-year from 2016 to 2020. Besides, as many as 26 slaughter facilities will be built across 16.4 hectares. Cooperatives will be established to strengthen connections among farmers, enterprises and consumers. A number of training courses will also be organised to increase knowledge of farming, feeding and caring for animals among farmers. Advanced technology application will also be fostered in local animal farms while waste water treatment facilities will be built to protect the environment./.